Though the matchup between the Patriots and the Giants might be drawing a lot of football fans, many people will be tuning into the Super Bowl just for the commercials! GM knows this too and this year, they’ve decided to enlist some alien actors for their funny Chevy Volt advert in order to help customers understand the technology behind their latest street-worthy innovation. From the looks of the commercial, it seems a lot of potential Volt buyers are confused about just how the vehicle gets itself around and with the millions of people watching the Super Bowl this weekend this ad will surely help educate some of them. The folks at Chevy have been expecting ever increasing numbers for their Volt but saw only 603 sales in January 2012 after moving a record breaking 1,529 units in December 2011. Some GM dealers have been refusing their allocated Chevy Volts and it looks like the company is trying to brace against downtrending sales. The very first Chevy Volts were shipped out in December of 2010 and GM has been hoping that the vehicle will — along with some “eco” versions of their regular models — help provide a new more environmentally friendly image for the company. The car can drive 25 to 50 miles using its electric engine before the extended range gasoline engine kicks in. Because it’s a whole new technology in the automotive world, education is key and getting customers to understand what lives underneath the hood of the Volt could help boost sales. 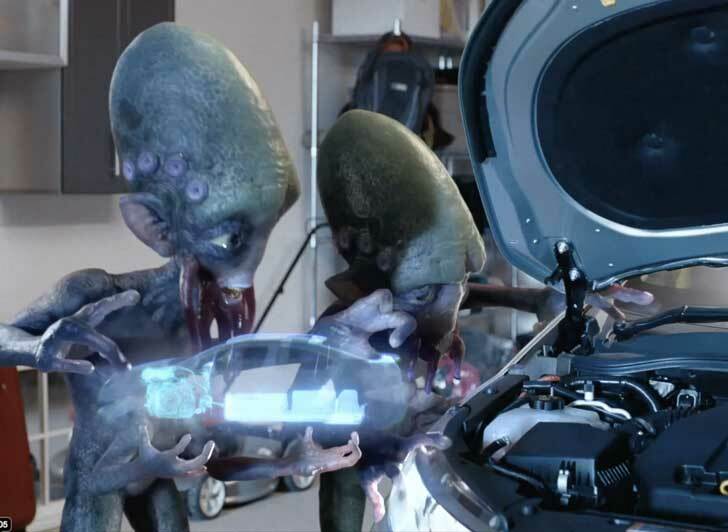 The aliens certainly won’t hurt the commercial’s popularity either. The only thing is, the Volt is hardly advanced -- certainly nothing compared to that flying saucer that harnesses energy from the environment, thus negating the need for plug-in or gas; not to mention its ability to FLY and change trajectories instantaneously without imposing lethal G-forces on its occupants. Cute, but very wrong. Though the matchup between the Patriots and the Giants might be drawing a lot of football fans, many people will be tuning into the Super Bowl just for the commercials! GM knows this too and this year, they've decided to enlist some alien actors for their funny Chevy Volt advert in order to help customers understand the technology behind their latest street-worthy innovation. From the looks of the commercial, it seems a lot of potential Volt buyers are confused about just how the vehicle gets itself around and with the millions of people watching the Super Bowl this weekend this ad will surely help educate some of them.